I started out playing drums while I was in junior high school. I watched a friend of my brothers (Ken Hohnstein) play when his drums were set up in the house and he was over. Over the years, I tough myself how to play the drums by watching other drummers and the old-fashioned way of putting the headphones on and playing along. After a few years of practice, I felt I was ready to share my love of music and making noise so I set out to join or start a band. While in Grade 10 or 11 I met up with a few other people in my school that had the same interest in making music. This is where I met up with current band member Steven Findlay. We started out in a band that we called Herbivore or Jimmy Skull Head or what ever we thought was cool at the time with a few others. This band did not last a long time. Shortly after this the band S.O.B.E.R was formed again by others in our high school. 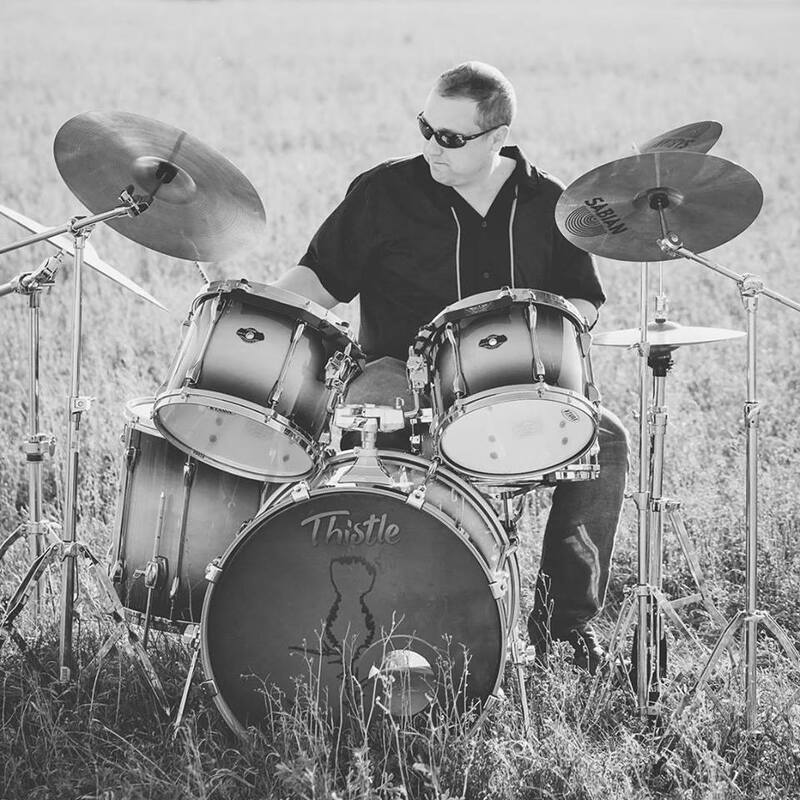 As time went on in high school the band broke up but my love of music and playing drums did not stop. After a few years, after going to school for business, I got back into playing in a serious band again. After S.O.B.E.R I had spent time jamming with other musicians and played the odd event, one including a wedding. After finishing NAIT in the April of 1999 it wasn’t long when I met Trevor Henson. We started to jam and we formed a cover band, Throes of Passion which then changed names a few times as well as other musicians. The name changed in the band and the members but we stuck together and formed a band called Throw Down. This was then changed, due to the name being used by another band out of the USA, to Dead Ring. Dead Ring was a hard driving rock or heavy metal band. After a few years’ life for Trevor had changed with the expansion of his family. The band broke up but Trevor and I kept in contact. I also had to take a break (about 8 years) to start my family where I married Laura Frey (used to be Higgins no I did not marry someone with my same last name). Shortly after marriage and buying a house along came our 2 boys, Benjamin and Henry, both interested in playing drums or at least in music. Never loosing my passion for music or being on the open stage I always wanted to get back into a band. During the summer of 2015 I started to practice again and jam with other musicians. Trevor was also interested in playing again. My brother (Kevin Frey singer/song writer and guitar player) had a chance to play a gig opening for local band Free Burn for a Halloween show. He asked me if I would be interested in doing a show with him. I was more than happy to try. After a few jams I mentioned that Trevor might be interest in joining as well. It was at this point the 3 of us started the band soon after to be named THISTLE. THISTLE started playing a few more shows after that one Halloween show and we decided to try and record the songs we had created. That proved to be a very successful event for the three of us. We played more shows and felt that we would like to put more depth into our songs and sound. That is when Steve Findlay was brought into THISTLE and joined sometime in early 2016. Many more shows were played with the four of us when we decided to again add more depth to our sound and songs. Since then we added Tania Riberio, near the end of 2016 and Henry Geerts. THISTLE has been promoting the CD that was recorded in 2016 and looking to play more shows. The five of us are also always writing more music and working on more cover songs. Thank you for listening to my story. A bit long, a bit like a history lesson. Thanks for taking the time to read up on myself and the other members.